France in London | Lunch in Notting Hill - The Ledbury! Lunch in Notting Hill - The Ledbury! Notting Hill has always been packed with restaurants that do not reflect the needs of the people who live there but more of the tourists who visit the area. It was about time therefore that someone dared to open a place that catered for its residents. 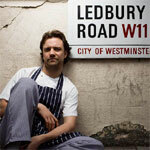 The Ledbury opened a few weeks ago and already has created a bit of a stir. New restaurants in the area always get people talking because they come and go so quickly that sometimes, you don’t even get to try them that they have already closed their doors. Some are very fashionable one night and gone the next. 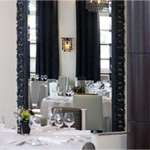 You might have tried the two previous restaurants at the same address as the Ledbury: Cassoulet and Dakota. Cassoulet wanted to be French but the food and the service were both extremely disappointing, Dakota on the other hand was an interesting concept but again the food was not always up to standard. It was very trendy, over-priced and there was no way to have a normal conversation because the place was so noisy. Well, I am pleased to report that in line with its sister restaurants Chez Bruce and La Trompette, The Ledbury is none of the above. It is cosy, modern and comfortable. The service is excellent and the food is not overly pretentious nor overly priced (at least not at lunchtime). I took a friend there for her birthday at lunchtime and we were both equally impressed. We went on a Friday afternoon and as you would expect in Notting Hill, the patrons were all dressed smart casual and the atmosphere was very relaxed even though the restaurant was full. You could very much enjoy the meal without feeling that you had to be part of the crowd. I had previously tried the sea bream at La Trompette and although I had found the dish superb, I was slightly disappointed that the skin had not been as crispy as it should have been. The skin in this case was nicely golden and very crispy. Something also quite unusual these days, the wine was not overly priced and the coffee that came was absolutely perfect in every way. Only negative, there was no chocolate or petits fours to accompany it. Most surprising! I am one of these people who don’t automatically want to have a desert but who really looks forward to a little sweet something with her coffee. This is perhaps a reminiscence of when I was a smoker and used to have my treat in the form of a cigarette after diner. So would I recommend the Ledbury? The answer is yes. 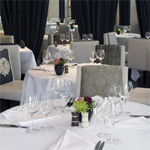 You will enjoy it and will feel that you have had value for money, particularly with the lunch menu. Monday to Sunday midday to 3pm and 6.30 pm to 11 pm, except on Sunday until 10.30pm. Really nice diner and very good surprise. All here worth the value and the product are really amazing. I’ll certainly go back there.